“We believe that the life of this building will be 2,000 years so we don’t care so much about 40 years,” said Piano speaking to Rowan Moore in The Observer. “The Colosseum is still there so I don’t see why it won’t be still there.” Both Italian-born architects, Piano and Richard Rogers (the latter settling in England during WWII) led the design team behind the now iconic building. The pair worked alongside architects Gianfranco Franchini and John Young, also from Italy and Britain respectively, as well as Arup engineers. 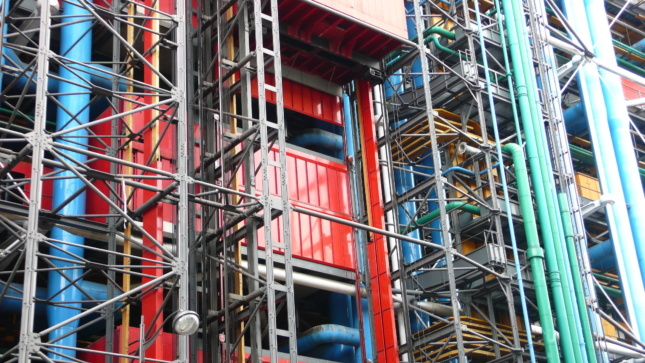 Though much-loved and well-visited today, the Pompidou Center suffered a rocky start when completed forty years ago. “Not many outside the charmed circle of modern architecture have even heard of Archigram and of its apocalyptic struggles in an unresponsive society,” said Reyner Banham in the year of the Pompidou’s opening. 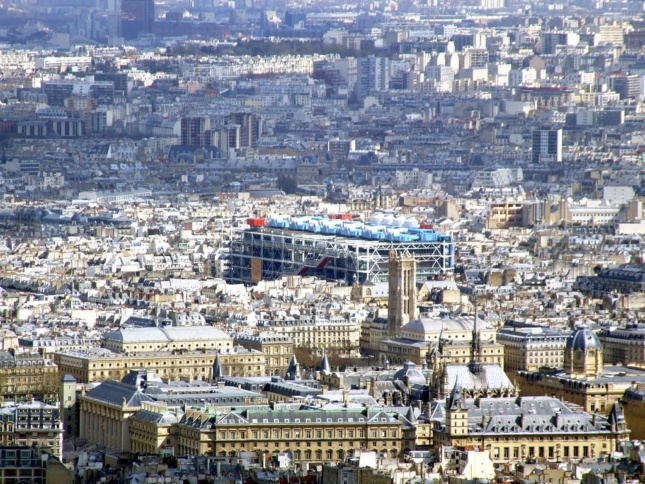 “…You don’t go to Paris to look at post-Corbusian modern architecture. Why then was the [Pomoidou Center] built to this sort of design?” he questioned. Sadly, only the escalators prevailed, but the structure remained an icon of “inside-out” and “high-tech” architecture. It’s active facade, visibly alive with visitors milling around, also showcases an array of structural detailings. With this external framework set for an amalgamation of complexities, Piano and Rogers originally planned for the structure to be able to have parts easily added to and taken away. The factory would change with technology. This too, however, was never realized. Their approach also perhaps reflects part of Piano’s childhood past. Growing up, his four other brothers were all builders. In an interview with The New Yorker, Piano recalled how his father questioned his teenage desire to be an architect and not a builder. “Keeping the action together with the conception is maybe a way to feel less guilty,” he contemplated in 1994. The ideas found in the Pompidou can still be seen in Piano’s work today. Extensive fenestration, openness, and proud and explicit tectonics are all prevalent themes throughout his projects. Perhaps this is because he sees the Pompidou Center more than most architects. The office of his namesake’s firm (Renzo Piano Building Workshop) and even his apartment are located in the Marais District, a few blocks from the former Center Beaubourg site. While massive in scale though, the Pompidou Center doesn’t fill all the space it was allocated. A sloping plaza which backs onto a series of unmissable air vents (which, in turn, outline the perimeter footprint of the center) allows the public to watch the goings on inside. In fact, 118,400 square feet of glass was used to compose the plaza-facing facade. On the roof, visitors can still enjoy vistas over Paris in all directions, taking in rare views over rooftops and onto the Eiffel Tower. Such egalitarian ideas had roots in Rogers’ architectural education. Under the leftist stewardship of Paul Rudolph and Buckminster Fuller, Rogers studied at Yale where he befriended fellow compatriot Norman Foster. Foster later went on to design high-tech architecture evocative of the Pompidou Center himself (see the Renault Distribution Center, 1982), reaching similar architectural heights in the process. Rogers’ and Piano’s meeting, however, was arguably more fortuitous. In 1969, when at the Architectural Association in London presenting his exhibit on light-weight structures, Piano bumped into a doctor for whom Rogers had designed a dwelling. The doctor, while worried one of his sons had given Rogers chicken pox, took Piano to meet Rogers. Rogers would later describe Piano and himself as “probably as close together in outlook as any two architects around.” They both went on to win the Pritzker Prize. 1969 was a momentous year for many reasons. Warren Chalk of Archigram wrote an article titled: “Owing to lack of interest, tomorrow has been cancelled.” A riff on Irene Kampen’s title, Chalk inferred the diminishing possibilities of a technological, utopian architecture. In France, Georges Pompidou was announced as President. As Banham suggested, Pompidou probably hadn’t read Chalk’s brooding, and so threw caution to the wind. With the dust still settling from the 1968 May riots which had brought social upheaval, a snap election and a veer to the left, Pompidou furthered former President’s Charles de Gaulle’s idea for a free library on the Plateau Beaubourg in Paris. 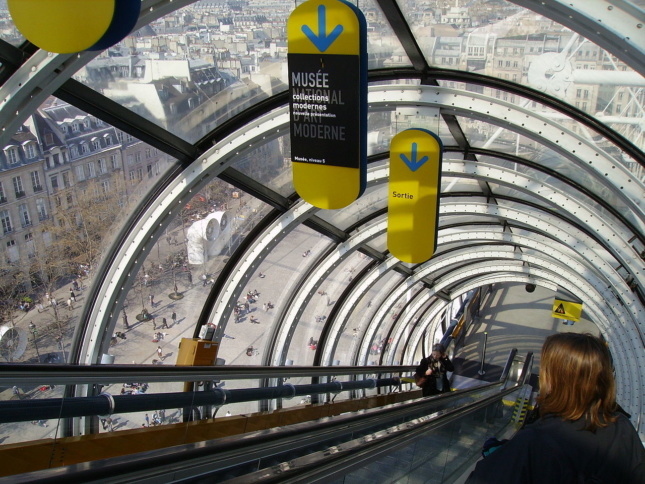 Pompidou also demanded that the building also became a center for the contemporary arts as the French capital feared its waning prowess in the art world. A competition was launched and 681 entrants from 49 countries saw their chance. Piano, Rogers, Young and Franchini—all in their early thirties—emerged as the unlikely victors. The group’s submission, like Piano and Rogers’ meeting, also rode its luck as it erred on the verge of not happening at all. Rogers opposed the idea of submitting, being more interested in a competition for a smaller museum in Glasgow. In what Piano described as a “beautiful little memo,” Rogers outlined his case. “Being an old lefty, I didn’t believe in a centralized, government-run art center, and certainly not one built in the heart of Paris,” he said in 1994. Thankfully Piano, structural engineer Ted Happold, and Rogers’ former wife Su were able to twist his arm. While its initial ill-favor is well documented, one wonders if the reaction would have been different had the Pompidou Center been completed earlier. With the spirit of ’68 still fresh in everyone’s minds, its values would have been both more apparent and relevant. 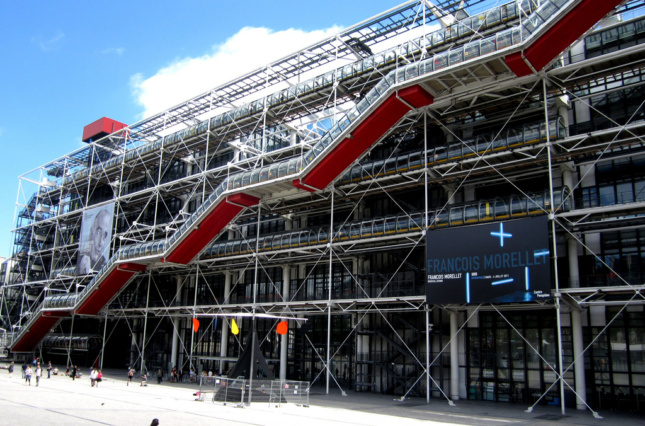 Georges Pompidou did not live to see the building’s completion and was not there to vouch for it. A decade after the center was built, however, another president, Francois Mitterrand, also shared Piano and Rogers’ skyward vision. In 1987, Mitterand inaugurated a clock that counted down to the end of the century. “A nation must orient its gaze toward the future,” he said. While that milestone has passed, no one has yet put a clock to countdown to the Pompidou Center’s 2,000th birthday. A two-year renovation in 2000 saw enlargements made to the center’s performance spaces, museum, and restaurant. Though this also resulted in visitors having to pay to use the exterior escalators, the center hasn’t lost its appeal. At forty, the culture factory is still functioning. 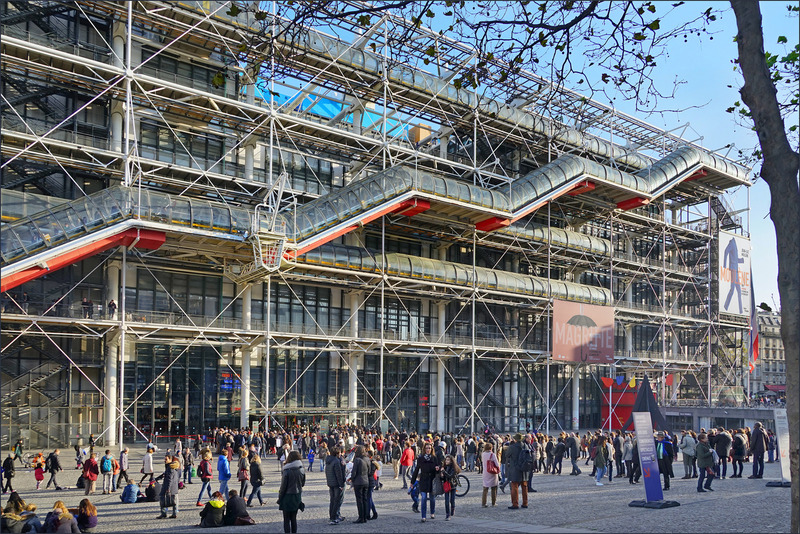 Still the biggest museum for modern art in Europe—boasting more than 50,000 works from 5,000 artists—the Pompidou Center continues to attract tourists in their droves—averaging around 3.8 million a year—from France and across the world.